Look closely or you might miss it. The gravel ghost (Atrichoseris platyphylla) is a master of disguise. At home in a small pocket of southwestern North America, this wonderful member of the aster family only puts on a show when rains offer the parched landscape a momentary reprieve. The gravel ghost is the only member of the genus Atrichoseris. 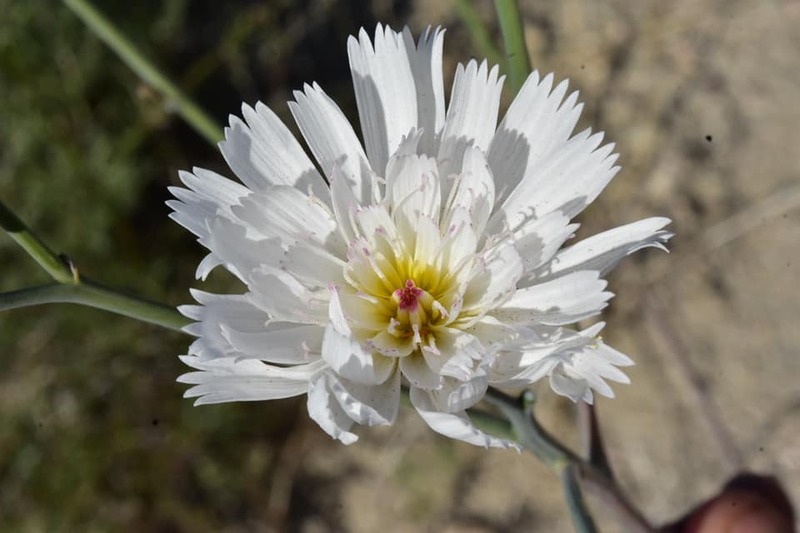 It is different enough from the rest of the chicory tribe (Cichorieae) to warrant its monotypic status. The gravel ghost is a winter annual meaning its seeds germinate at some point in the fall and the plant spends most of the winter putting on growth. As you can probably imagine, life in this corner of the world is pretty tough. Rain is sparse to non-existent and many plants teeter on the edge of desiccation. The fleshy, semi-succulent leaves of the gravel ghost likely store just enough water to offer some insurance against prolonged drought. 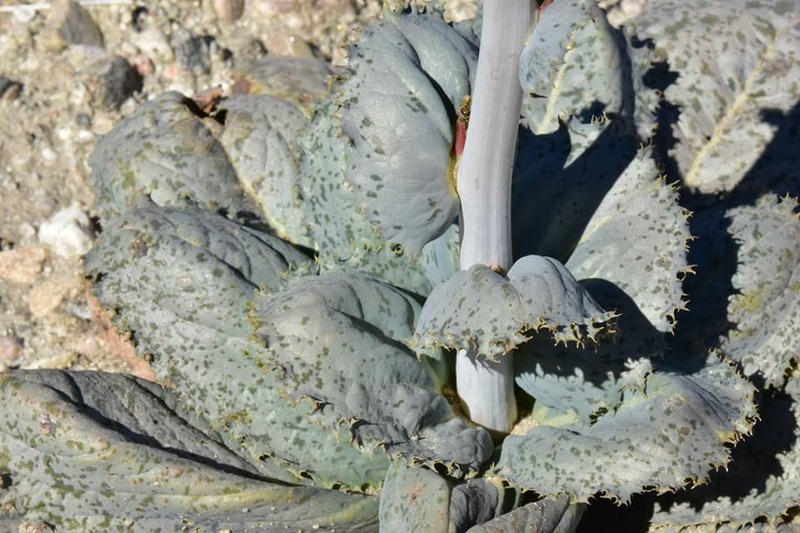 As if drying up wasn’t enough for this plant, the desert’s compliment of hungry herbivores are constantly on the lookout for any plant remotely alive that can offer sustenance. All it takes is a few encounters with the gravel ghost to understand how this plant manages to avoid as much attention as possible. 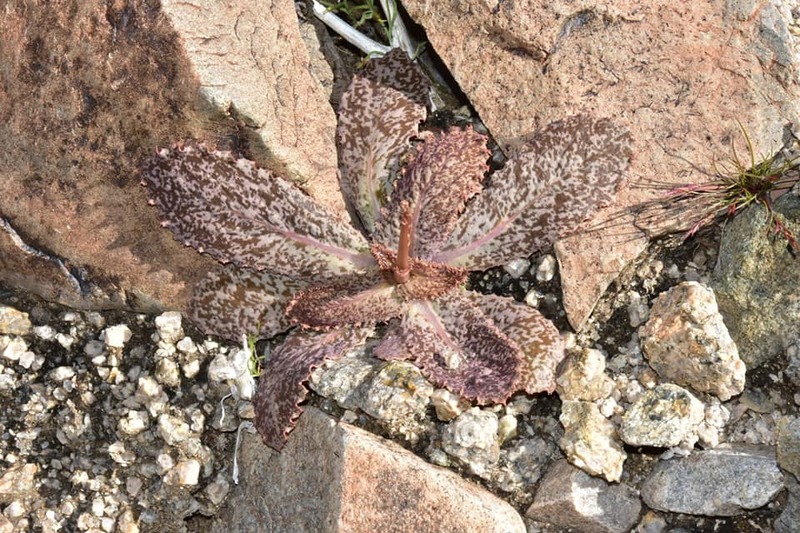 As its common name suggests, this species blends in with the surrounding soil to an extreme degree. From what I can gather, there appears to be a lot of variation in gravel ghost leaf color depending on where the population is growing. Some are mostly green whereas others take on a mottled grey hue. Still others seem to have settled on a mixture of browns. It seems that no matter the substrate, the gravel ghost will do its best to blend in. Personally, I would love to see someone investigate what kind of genetic or environmental controls dictate leaf color in this species. It is fascinating to think about how plants can disguise themselves against herbivores. Starting in late winter and early spring, the gravel ghost needs to complete its annual life cycle. 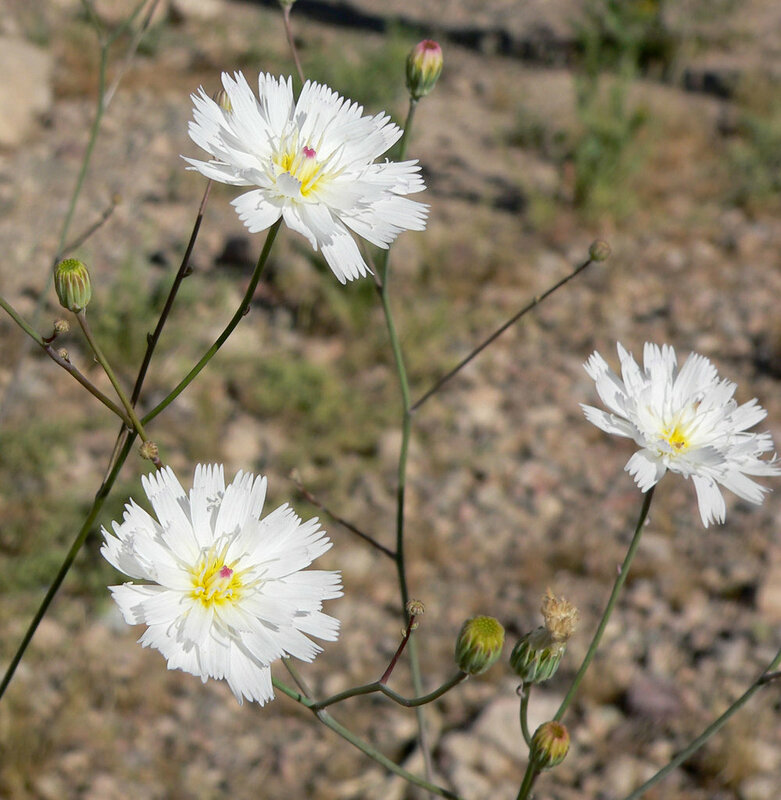 When rains punctuate the drought, the gravel ghost sends up a spindly inflorescence tipped with a few flower heads. If they are lucky, some stalks will avoid being nipped off by sheep and rabbits. Those that do put on quite a floral display. Each head or ‘capitulum’ explodes with clusters of bright white ray flowers. Only at this point does its affinity with the chicory tribe become apparent. The need for such a high impact floral display has everything to do with being an annual. There is only limited time for pollination and seed set. Each gravel ghost must produce enough seeds to enure that at least some survive. They simply don’t have multiple seasons to reproduction. Luckily its a member of the aster family and the opportunity for seed production is usually relatively high. With any luck, plenty of pollinators will find these plants tucked in among rocks and gravel and the process will begin again come that fall.